We are back in Jakarta. 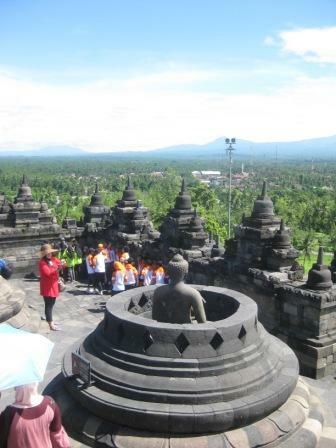 During the last twelve days we have been on the road exploring Java. We got as far as Yogyakarta before heading home. 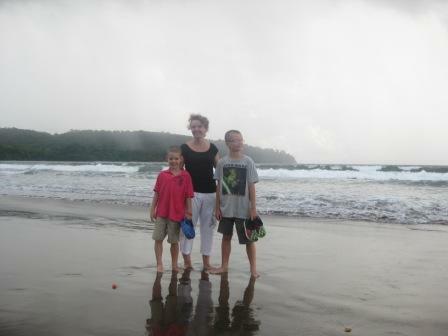 We travelled 1640 km but only managed to get half way across the island. The roads were not good and most distances were driven at an average speed of 40km/h. 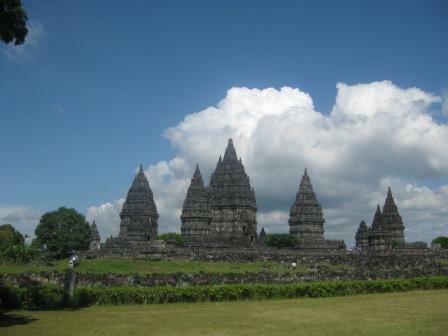 The population of West and Central Java seem to inhabit the space along the major roads and we often drove through endless towns having expected to be in the countryside. The Toyota is not a car we can get attached to but it deserves a lot of credit for making our road trip so successful. I even got a little protective of the car as we drove through the Taman Safari Park, worrying about the paintwork and the damage caused by the animals climbing over (and biting) the car. I’m sure I scoffed at my Dad some forty years ago as we drove through Blair Drummond as the monkeys scratched his red Ford Cortina. 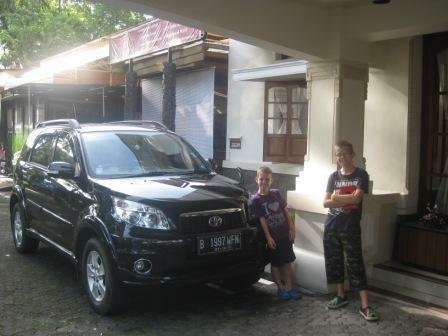 We first drove to Bogor, only some 60 Km from Jakarta. 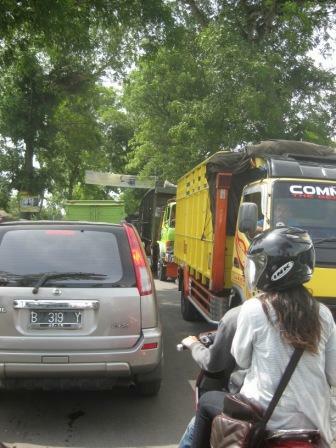 We got to Bogor quickly but then had first hand experience of the Indonesian way of traffic management. We were not allowed to take the turn off for the organic farm where we were staying and got caught in a traffic jam. At weekends especially, they close one direction of travel for a few hours and use all the lanes for traffic travelling in the opposite direction. They then reverse the direction of traffic to keep it fair. 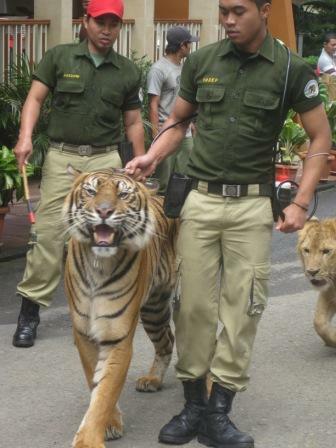 The Permata Hati farm was far from welcoming. Outside our room door there was this stunning view but it could not make the place any more comfortable or hospitable. Breakfast one morning was a loaf of bread, UHT milk and chocolate sprinkles, all still in their packaging. There was an ant infestation in our toilet and other less desirable insects. 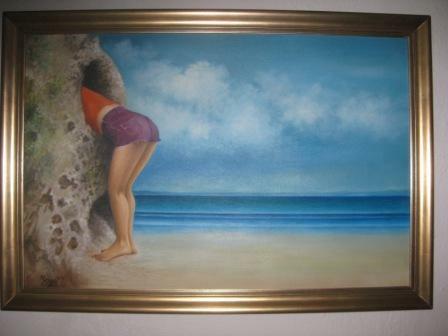 No towels or soap or hot water. 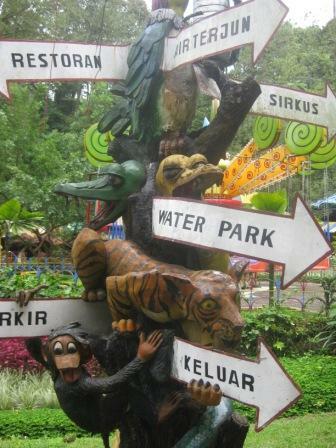 However, we did have a wonderful day at Taman Safari Park close to Bogor. We drove round the enclosed area and got close to lots of animals: the highlights must be the tigers and lions and we watched in awe as one tiger attacked a huge tour bus. I would have accepted those scratches on my car. Following the drive through we visited the attractions: dolphin and sea-lion displays, an absolutely super wild west re-enactment with trained chickens, rats, cats and vultures (lots of questions from Lucas afterwards along the lines of “how do they do that?”) – and tigers reluctantly working through a show. Next day we drove on to Bandung. Didn’t get much of a chance to explore this city but the hotel we stayed at was brilliant. The Bumi Sawungalling still has great charm. Huge rooms and clean comfortable beds. Then it was the drive to Pangandaran over the Puncak Pass. We stopped at a strawberry farm and watched the Indonesian paratroopers jump from their aircraft. Buses and lorries inched and groaned their way up massive gradients while some local motorists (the ones who can see round corners) overtook them seemingly oblivious to the risk. 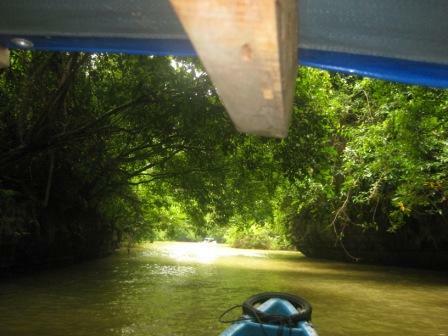 Pangandaran is on a narrow isthmus on the South coast. The nearby headland is a forested national park. 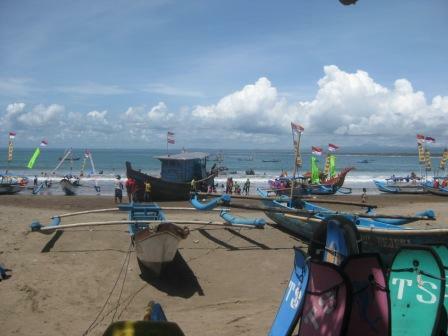 The strip of dark and sticky sand is advertised as Java’s premier beach resort. 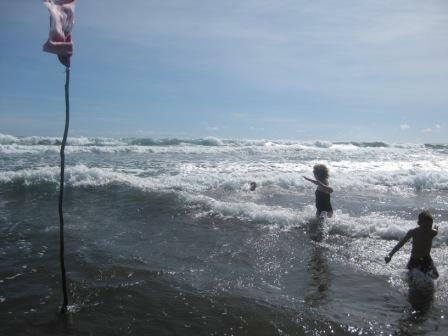 Perhaps it has seen better days but we had a great time jumping the Indian Ocean waves and exploring the park. We met monkeys, deer and a large lizard as we searched for caves. 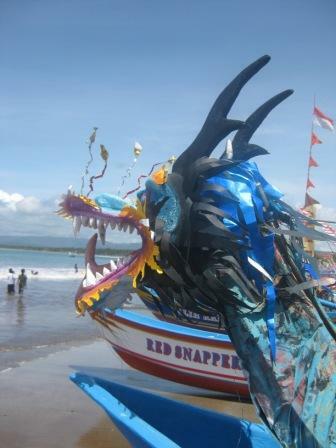 A local festival was in progress involving brightly decorated fishing boats. 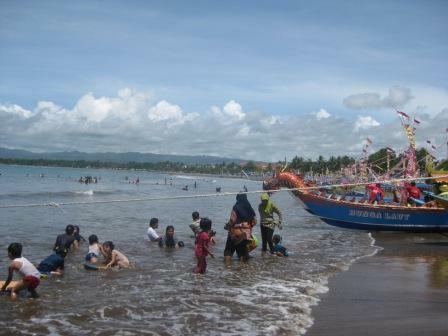 Locals and visiting Indonesians enjoying the beach and the waves. We would have liked to have hired bikes but were unable to find any that worked safely. One great memory was looking up in the sky at dusk to see the giant fruit bats (flying foxes) heading off to their feeding grounds. 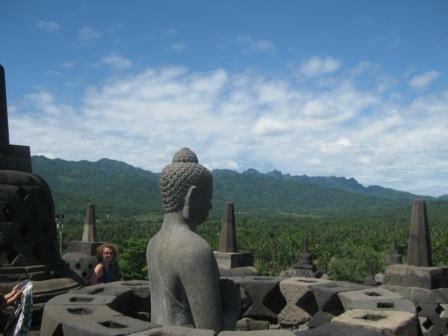 And then it was on to Yogyakarta for Christmas. A massive day’s driving to get there meant we arrived later than expected at the Phoenix Hotel. The following day (Christmas Eve) we visited Prembanan Hindu Temple. 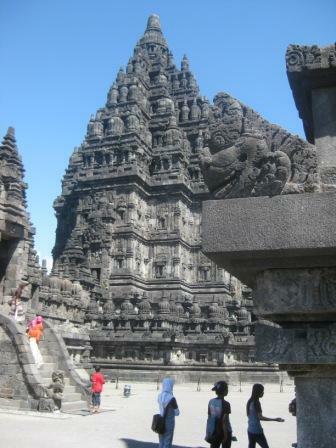 On the road to Solo, 17km from Jogya, the temple was brilliant. We were the centre of attention driving up in our car and throughout our walk around the temple. 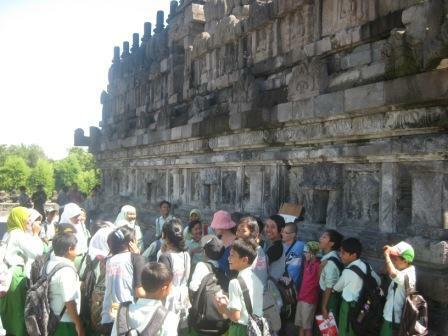 Large groups of school children in bright uniforms were eager to take our photograph and speak with us. The same afternoon we visit the Kraton ( the Sultan of Yogya’s palace) and then walked back to our hotel along Jalan Malioboro where Cairo bought a dodgy watch. We headed out to a local restaurant on Christmas Eve passing the sumptuous buffet laid out in the Phoenix. If this is Christmas Eve, we thought to ourselves, what will Christmas dinner be like? 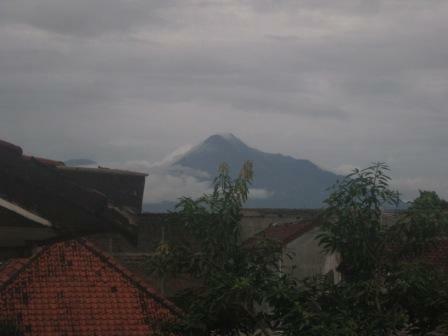 We had planned to be up Merapi on Christmas morning. 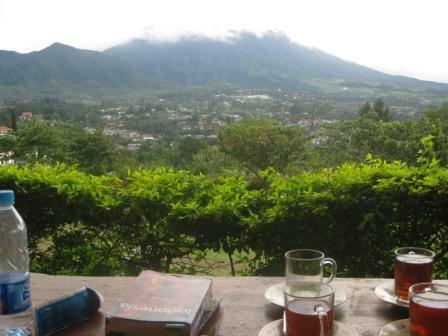 We were picked up at 10pm from our hotel and driven to Selo on the Southern slopes of Merapi. We set off at about 1 am and the climb was instant. We managed about two and a half hours climbing but then decided the risk was too great. The temperature dropped significantly near the first plateau and it began to rain. Our guides did not inspire confidence. It was still a hazardous descent in the dark back to the guide hut. We returned to our hotel to open stockings and presents. However, to Shona’s great disappointment, no Christmas dinner. Christmas Eve’s buffet was Christmas dinner. Still trying to work this out. 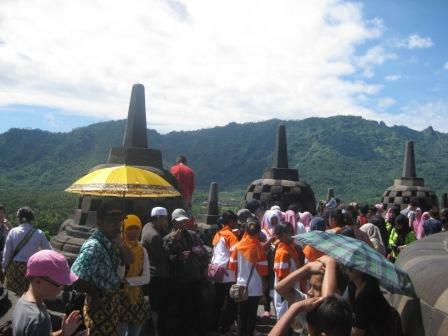 Boxing Day we head for Borobudur. Looming out of a patchwork of green, this colossal 1200 year old Buddhist monument was covered in tourists. We found tranquility in Plataran Villa Resort and ate lunch on a James Bond film set. 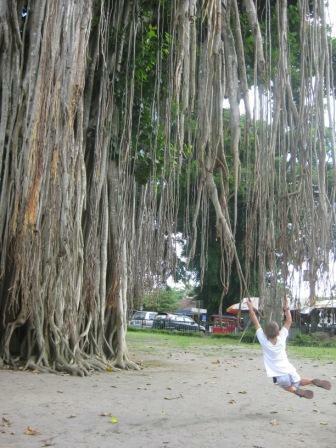 We stopped at Mendut Temple to see the magnificent large statue of Buddha housed in an insignificant building, a great row of souvenir stalls and a large tree that let Lucas work on his Tarzan swing. Next day we started the return journey. 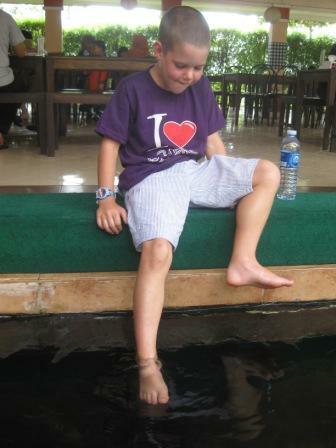 We found a splendid road-side service station called Pringsewl with take it or leave it dishes, delicious, magic tricks and those fish that nibble your feet. Perhaps not as controlled (or hygienic) as those on offer to shoppers at Silverburn but only a few thousand rupiah. 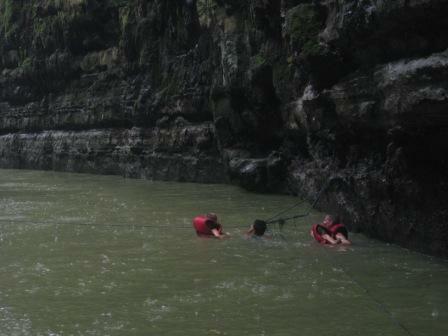 Another couple of nights at Pangandaran and one of the highlights of the holiday: the Green Canyon. We paid 75 000 to hire a boat for 45 minutes. We travelled up the canyon until it got narrow. We then negotiated some more time, and buoyancy aids, and we jumped in to swim with the flow. 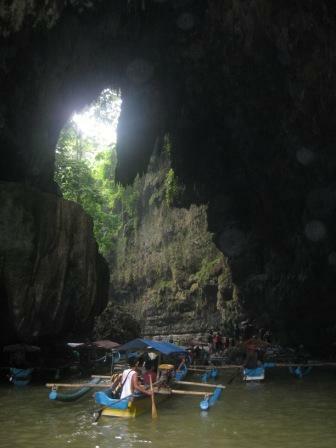 Canyon filled up with other Indonesian tourists. Only time I’ve seen a traffic jam with boats. 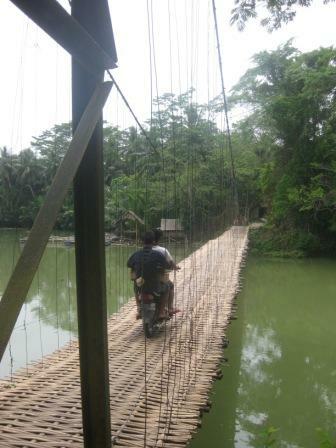 We then tried to get to a fishing village for lunch but couldn’t get the car over the bridge. 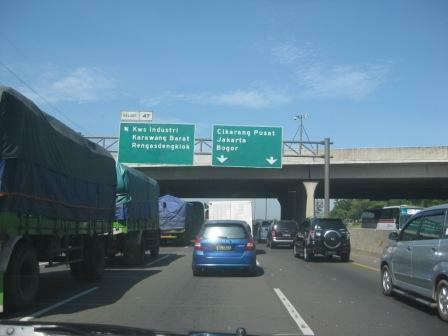 Back to Bandung for one night and the return to Jakarta the following day. We are so proud of Lucas today. 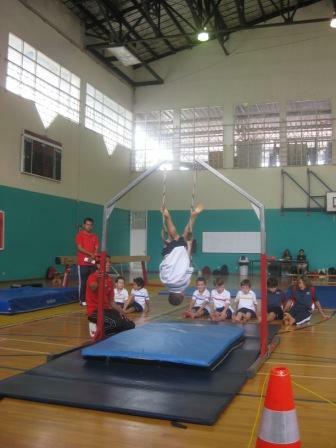 Even though he was very nervous and anxious (lots of t shirt pulling) he took part in a gymnastics competition this morning at BIS. 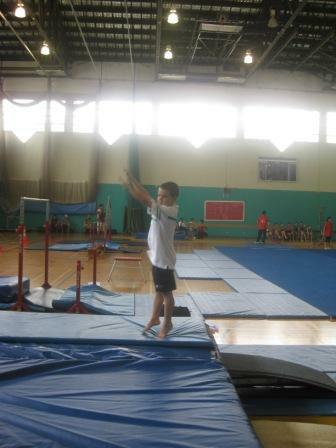 In the enormous gym hall, with lots of other participants (so many that we were the third tranche of spectators) he completed the rings, floor, vault and parallel bars. 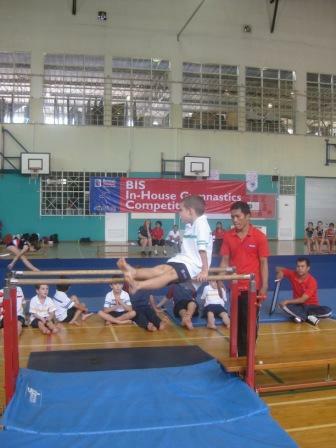 He achieved two 4th place finishes and a podium place (third) for his routine on the bars. Wow! My second full marathon. I now know that you can’t enter a marathon (at 47) and expect to finish in a reasonable time without putting in the training. You can run a half marathon in under two hours (if you run regularly) but there is nowhere to hide in the full. 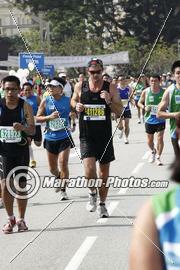 I entered this marathon before I had experienced the heat and humidity of Jakarta. For preparation I did nothing beyond runs of two hours. It should not have come as a surprise that I wilted after three hours and my legs went dead. I could make the excuse of being locked out of my starting cage with ten minutes to go before the start, or the chaos at the bag drop, or the sheer numbers of people at the start (20 000) that forced you to walk for the first couple of kilometers, or the sheer numbers at the end as the half and 10K and marathon runners all converged for the final two kilometers, or (as I had been warned) the humidity was worse than in Jakarta… I won’t and last Sunday it wasn’t. 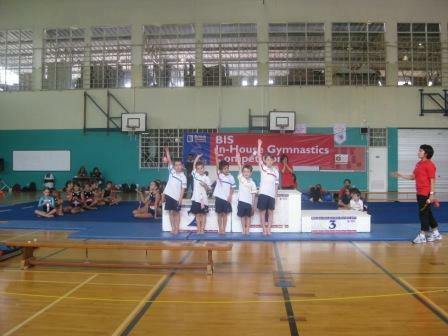 Still enjoyed the experience – even the 5am start. Singapore jaw-dropping if you live in Jakarta. Draught Guinness at the airport. Back next year.